Choose: 24,000 Grain Capacity - 0.75 cubic ft. 32,000 Grain Capacity - 1 cubic ft. 48,000 Grain Capacity - 1.5 cubic ft. 64,000 Grain Capacity - 2 cubic ft.
24,000 Grain Capacity - 0.75 cubic ft. 32,000 Grain Capacity - 1 cubic ft. 48,000 Grain Capacity - 1.5 cubic ft. 64,000 Grain Capacity - 2 cubic ft. 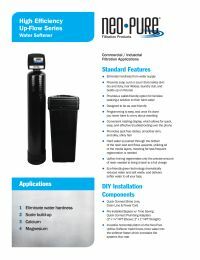 The Neo-Pure High Efficiency Upflow Series features Professional Grade Metered Water Softeners designed by Fresh Water Systems to eliminate hardness from your water supply. When hard water minerals are combined with heat it forms scale build-up. Scale causes costly build-up in your plumbing, water heater and other water-using appliances. When combined with soap, the minerals form soap curd or scum that makes skin dry and itchy, hair lifeless, laundry dull, and builds up on fixtures. A Neo-Pure Upflow High Efficiency Water Softener provides a wallet-friendly option for families seeking a solution to their hard water. These softeners were designed to be as user-friendly as possible. Programming is easy, and once it's done you never have to worry about resetting it- even in a power outage! Your only maintenance will be to occasionally check the salt level and add more when needed. Money Saving This softener will save you expensive maintenance costs spent fixing appliances that are damaged by scale, as well as soap, salt, and water costs. Eco-Friendly The Neo-Pure Upflow Softener uses up to 75% less salt and wastes up to 65% less water than standard efficiency softeners. Simple Programming The Neo-Pure Meter is extremely easy to program. Just enter the number of people in your home, time, date, and the hard water level. High Efficiency The horizontal piston on the Neo-Pure Upflow Softener head forces more water into the softener faster which increases the systems flow rate. Pre-installed Bypass w/ Time Saving Quick Connect Plumbing Adapters (2 x ¾" NPT Elbows; 2 x 1" NPT Straight). Many generic and standard efficiency water softeners use downflow brining, which entails pushing the hard water through the top of the resin bed, and up through the middle of the tank. However, the hard water typically settles on top of the resin, so much of the media is not used and the softener must regenerate more frequently. 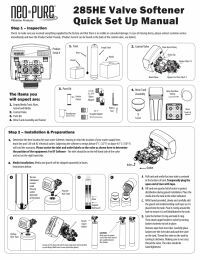 Neo-Pure High Efficiency Water Softeners feature upflow brining, also called counter-current brining, which is the most efficient and effective way to regenerate a water softener. This type of softener regenerates resin by removing the contaminants through the same direction they came in, so they don't contaminate the clean resin. The hard water is pushed through the bottom of the resin bed and flows upwards, utilizing all of the media layers, meaning far less frequent regeneration is needed. Additionally, upflow brining regenerates only the precise amount of resin needed to bring it back to a full charge. This green technology dramatically reduces water and salt waste, and delivers softer water to all your taps. 15" x 15" x 34.7", 8" x 44", 9" x 48", 10" x 54", 12" x 52"
There is a 5 year warranty on the control valve, and a 10 year limited warranty on the fiberglass tank. Please contact the customer service department for more details.